The new Task Force on Farming Regulation are calling for opinions and ideas on ways to improve approaches to regulation as part of a wide ranging consultation launched today. “Regulations have nearly always been put in place for good reasons but not necessarily in the best way. There is too much red tape tying up our farmers and food businesses. “We want farmers, growers and the food industry, who often complain about excessive regulation and bureaucratic processes, to help us to improve the system. This is a major consultation exercise to identify the issues and find solutions and we encourage all interested parties to submit evidence personally or through trade and representative bodies. The consultation will be open until 31 October. 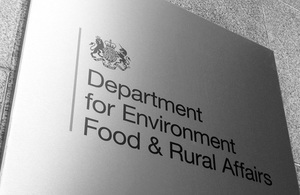 Evidence can be submitted online at engage.defra.gov.uk/farm-regulation/ Written submissions can be sent to FarmRegulationTaskForce@defra.gsi.gov.uk or to Task Force on Farming Regulation, Area 8D Millbank, Department for Environment, Food and Rural Affairs, Nobel House, 17 Smith Square, London SW1P 3JR. All comments will be captured and recorded in summary in the Task Force’s final report in 2011. The Task Force on Farming Regulation was announced by Jim Paice at Cereals 2010 on 9 June 2010.